Buttery and fluffy and soft and peanuty and filled with dark chocolate in the middle I MEAN what more do you need in life? Let me be honest with you though. 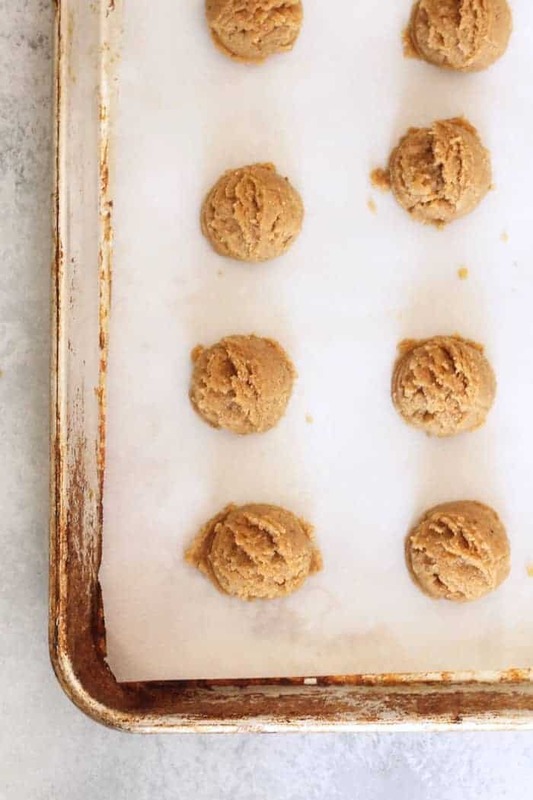 As a total cookie lover and peanut butter fanatic, peanut butter cookies were never my go-to. Chocolate cookies, sugar cookies, snickerdoodles, cream cheese cookies…get in my belly. But peanut butter cookies? Meh. Where’s the chocolate, yo? But Jeff, you see, adores peanut butter cookies. I think he likes them more than he likes me. I knew I wanted to bake something nomtastical this past weekend so I took his love for peanut butter cookies and my deep dark chocolate obsession (and ok fine, way too many HERSHEY’s kisses for my own good) and set out to make those wonderful little peanut butter blossoms I remembered from childhood. While I didn’t grow up making Christmas cookies per se (I’m Jewish! ), I’ve eaten my fair share of them over the years. I used to take cooking classes with the most awesome lady named Betty Buns. I have vivid memories making meatloaf and banana bread and chocolate chip cookies at the ripe age of ten. The passion started when I was just just a tot! So you can imagine my excitement when I found my beloved Betty Buns cookbook while searching my mom’s cookbook cabinet for recipe inspiration. I took Betty Buns’ Peanut Butter Blossoms recipe and worked my magic. The holidays are as a good a time as ever to indugle, but I saw no harm in taking out a bit of the sugar, swapping the white flour for white whole wheat (I get mine at Trader Joe’s), and using less refined sugars like coconut sugar + organic cane sugar. Oh, and a wee flax egg! By the way, you don’t need a big fancy mixer to make these. I don’t have a big fancy mixer. If you don’t own one of these super affordable hand mixers, get it on your holiday list stat! You would nevereverever know these were healthyish at all. And I mean, they’re still cookies with a stick of [vegan] butter and a bunch of sugar because…’tis the season! Save the kale salads for next month, my friends. 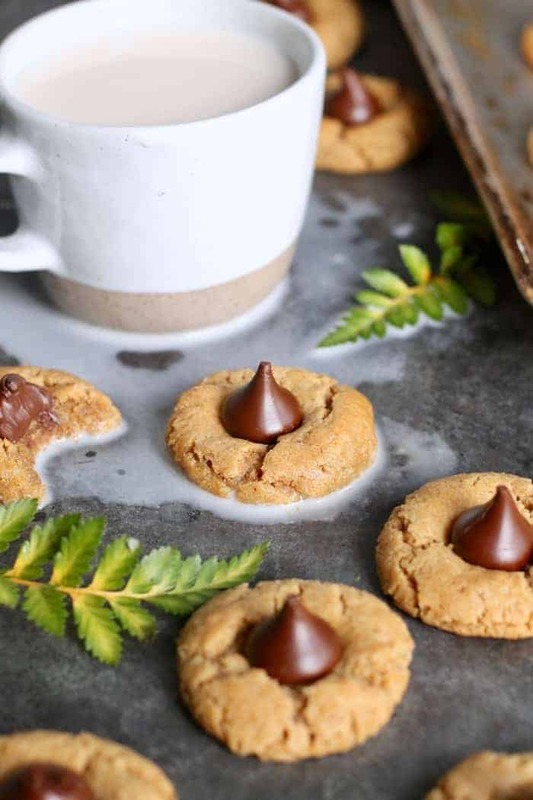 I found that the key to getting the chocolate kisses to stick was the bake these bad boys for 8 minutes, quickly dot each cookie with a kiss (so cute), then bake for one minute more. I don’t like my cookies crunchy in the slightest (underdone, please), but if you like a crunchier cookie, by all means bake them a couple minutes longer. P.S. I definitely accidentally spilled the milk in these photos and decided it looked cool. Does it look cool?? Okay too much talking and too little cookie-ing. Hop to it!! Preheat oven to 375F. Line two cookie sheets with parchment paper. Make sure you have about 23 unwrapped kisses ready to go. Mix together ground flax and water in a small bowl. Set aside. In a large mixing bowl with a hand mixer or in the bowl of a stand mixer, cream peanut butter, vegan butter, and sugars until light and fluffy, about 2 minutes. Add the flax egg and vanilla and mix to combine. Add the flour, baking soda and salt and mix until just combined. Roll dough into smooth 1-inch balls (I used a cookie scoop) and place 2 inches apart on baking sheets. No need to flatten. Bake (one cookie sheet at a time) for 8 minutes. Remove from oven and immediately press a chocolate kiss into the center of each cookie. Return to the oven and bake for one more minute. Remove from oven and cool on a cooling rack. *If using unsalted peanut butter, add 1/4 tsp salt to the recipe. My blog has been kind of wonky with messing recipes up lately—thanks for pointing that out. All fixed! Alexis, these look incredible. Do you take your own pictures? They’re beautiful! Thanks my love! Hope they’re the most delish ever. Saw these on Instagram so I had to hop over to see the recipe. They look so delicious and I love that they’re vegan too! Do you have to press the cookies down first? or just leave them as a ball? Nope! Just roll them into a smooth ball. They’ll flatten while they bake and also when you put the kiss on them. Enjoy! These look amazing! And yes, the milk spill definitely looks cool :-)! Hahah can’t wait to make them! Haha it definitely made the photoshoot snacking extra delish!! These cookies are going to be on repeat until further notice they’re THAT good. Hope you love them! Have you tried using egg instead of flaxseed “egg”? Wondering what the recipe would call for if I wanted to use a regular egg! So adorable!! I need to make these sometimes soon. 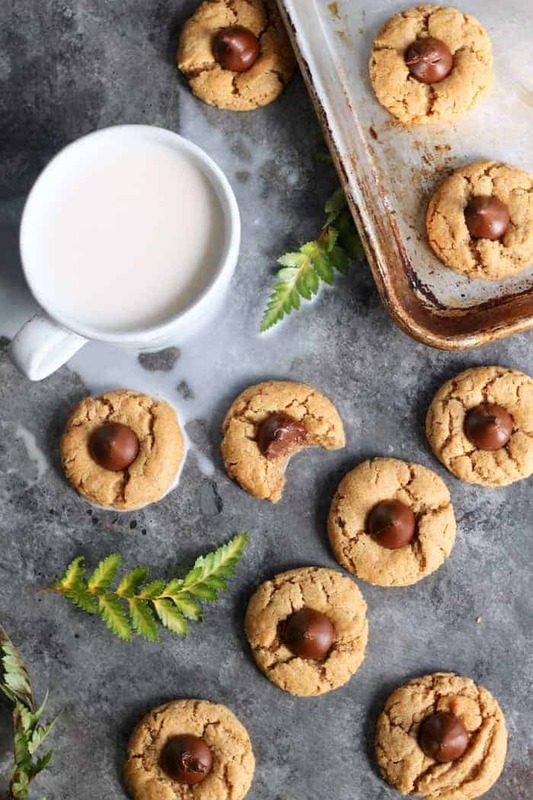 I’m a peanut butter cookie lover, but combining them with chocolate is even better! I do love the spilled milk – supah cute, and I love your photos! Thanks, Alexis! Eee thanks love!! Isn’t chocolate and peanut butter the most heavenly combo?! All the peanut butter blossoms, please. These look amazing! Thanks so much for sharing your awesome recipe! You’re so welcome! Don’t you just want to eat these by the plate full? I’m in holiday baking mode and these look FANTASTIC!! Seriously!! I hope you love them as much as I do!! Gotta feed the baking beast. Yes!! One of my favorite Christmas cookies. Our neighbors used to make them all the time for us growing up. I’m with you on the underdone too and I think the milk looks good haha! The nostalgia just makes them taste a billion times better! Hi I was wondering if gluten free flour would work? I made the recipe exactly as written , but my cookies came out really flat and crunchy. I was wondering if you have any tips for me on what might be going wrong? My initial thought was the dough was a bit oily which might have made them spread, so maybe I might try these again with regular peanut butter. Oh no! I haven’t gotten any feedback about them being flat till your comment so I’m trying to think what could’ve caused that…you could try refrigerating the dough before baking? You didn’t melt the butter did you? I used the drippy kind of peanut butter with just peanuts and salt, no added oil. Make sure not to pack the flour either. Hope this helps! If I wanted to make these gluten free, could I sub in a gluten free flour 1:1? I haven’t tried it but I’d suggest something like Bob’s 1 for 1 GF all purpose baking flour ? Did you make the chocolate chips yourself? Nope! I usually get them from Trader Joe’s. Excuse me but these look almost too good to be true. I wish I could go back in time a few days and make these for Christmas!